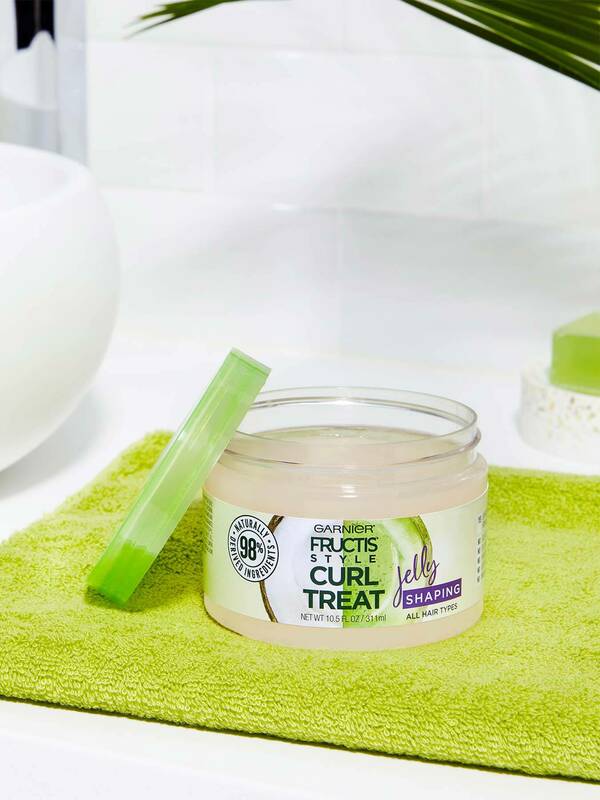 Garnier Fructis Style Curl Shaping Jelly Treat is a leave-in styler for curly hair made for all hair types made with 98% naturally derived ingredients. A 98% naturally derived ingredient is unchanged from its natural state or has undergone processing yet retains greater than 50% of its molecular structure from its original natural source. 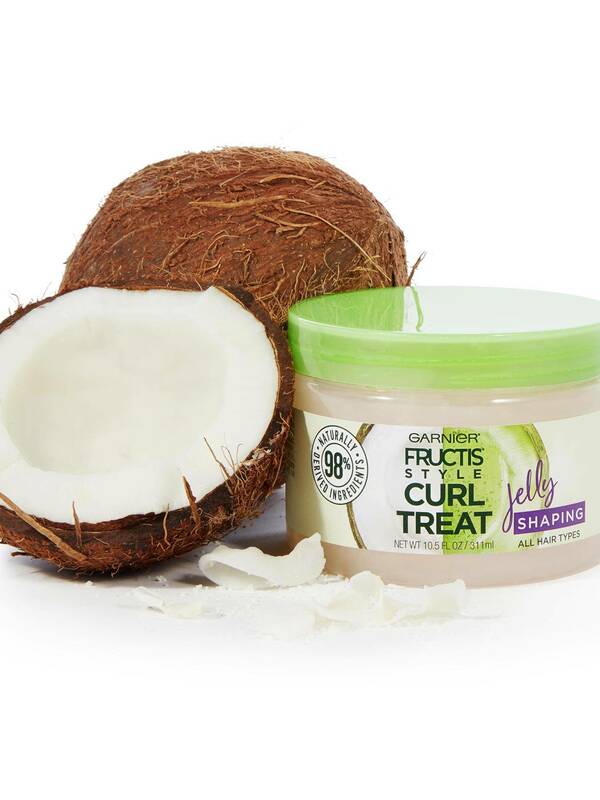 Garnier Fructis Style Curl Shaping Jelly Treat is a 92% biodegradable formula made with no sulfates, no silicones, no parabens, no artificial colorants, and no mineral oil. For up to 24 hour frizz resistant curls with control and shape with light hold, apply a quarter-sized amount to slightly damp hair, distribute evenly and scrunch, then let hair air dry. 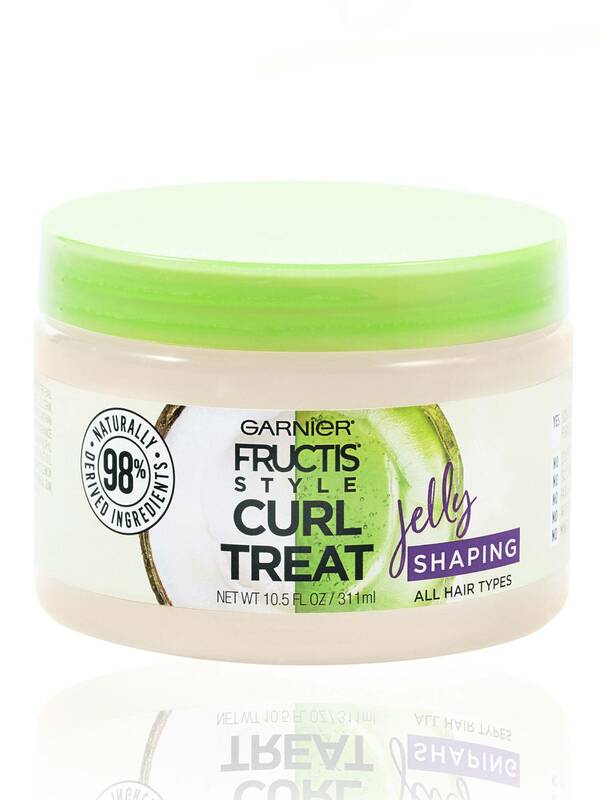 Garnier Fructis Style Curl Shaping Jelly Treat is suitable for color treated hair and formulas may vary slightly in color and consistency. For up to 24 hour frizz resistant curls with control and shape with light hold, apply a quarter-sized amount to slightly damp hair, distribute evenly and scrunch, then let hair air dry. Rated 5 out of 5 by Curls for Days from Great for fine, low porosity curls This is my favorite grocery store find for holding curls and nearly eliminating frizz. I have fine, low porosity, low density 3a and 3b curls, and I try to follow the Curly Girl Method. It's so difficult to find reasonably-priced styling products without silicones that work well for my hair type, but this jelly does the job! I get beautiful day 2 and day 3, even day 4, curls when I refresh with this and water. It does leave my hair crunchy once it's dry, but I just scrunch out the crunch and I'm left with soft, shiny curls. If you have hair like mine, I highly recommend this jelly! Rated 5 out of 5 by veslynev from This is a great drug store option for curly haired girls that don't want to dish out a crazy amount of money. Leaves my hair feeling healthy and shiny with the right amount of hold. I love this entire line of products! Rated 5 out of 5 by kaylala9b7 from I have long, wavy/curly hair. It's not in the best shape right now. It's dry, dull, and just not looking good. 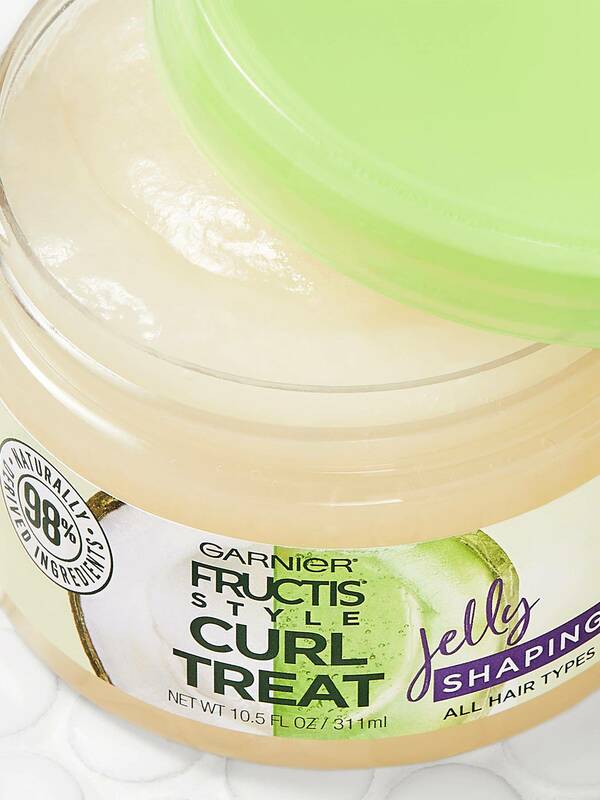 Garnier Fructis Style curl treat jelly works so good with my hair. It helps with frizz, and helps define the curls I do have. Rated 4 out of 5 by krishchic from I gave this product 4 stars because it shapes the hair well and the curls are long lasting but white flakes do start to occur after a few hours. Its very affordable though and doesnt leave the hair feeling hard or dry like most gels. I would def but again.